Lewis Bartholomew is an inspired man. For the last 16 years Bartholomew has pursued his passion—an insatiable curiosity to discover and honor the stories surrounding the warship HMCS ALBERNI. On one of his many trips between Seattle and Canada he stopped to read the inscription below a painting of this warship on the Queen of Alberni. “I had met a Canadian, and was coming up once a month, always seeing that picture, but not really paying much attention to it,” he recalls. When he read the inscription he was filled with such a welling of gratitude for the men who fought for our freedom that he was ignited from within to pursue the histories. “Here was a tiny warship, a young crew, taking great risks for their country and the freedoms that we all enjoy. And many of them lost their lives in the process,” he says. Bartholomew went back home to Seattle and immediately began researching. “Yet I could find nothing in those early days of the internet and its primitive search engines,” he says. Bartholomew had been traveling back and forth to Courtenay for a long distance relationship. “I had a really good union job, a really nice SUV, great health and a beautiful condo,” he says. “But I really wanted to move to Canada. They suggested he create a mobile memorial in some form. “I opened the door in my head, so to speak, to develop a mobile exhibit I could take on tour,” he says, noting that in its first days the exhibit was basically a table, a canopy, and an IKEA backdrop that flipped open to show photos. “As I got more money I would purchase more display units,” says Bartholomew, who funded the entire project out of his disability check. The exhibit can range from a small table with a backdrop to a 40-foot exhibit, including a circular tent and a trailer that converts into a movie theatre depending on the location and duration of the event. This portable exhibit in all its variations is known as The Alberni Project. In 2010 the project was featured as part of the National Remembrance Day ceremony in Ottawa. 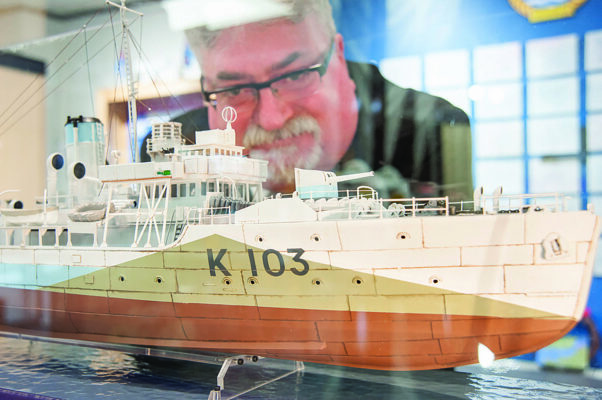 The Alberni Project Society encompasses both this traveling display and the HMCS ALBERNI Museum and Memorial, which is the concrete counterpart currently housed at the Comox Mall in Comox. “The title,” explains Bartholomew, “comes from the very last words spoken in a letter from William Kinnear Leslie to his wife when he’s writing to tell her how excited he is about the birth of their daughter. He died five months later on the front lines.” The display holds a copy of the original letter from Leslie, as well as medals sent to his widow after his death, and black and white photos of him on horseback and in his battalion. Bartholomew continues to relate the story and the details he shares show his dedication to uncovering the stories that have been buried over the years. Taking it one step farther, Bartholomew contacted a former student of his who was being transferred to Belgium. He asked if she would drive down to Vimy Ridge, to visit the grave of William Kinnear Leslie, who rests in Villers Station Cemetery in France. Pictures of the grave site and their visit rotate in a digital photo box on top of the display. “One hundred years after the man’s death, his sacrifice, and that of other Canadians, is still affecting a whole new generation of people,” says Bartholomew, who feels that the story is a story of valor, courage and a father’s love. 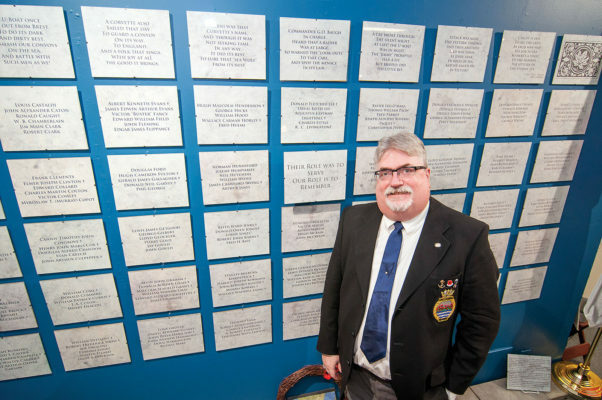 The heart of the program is the memorial, a wall of names and information about the HMCS ALBERNI. Here each of the 59 men who died when the HMCS ALBERNI sank on August 21, 1944 are honored, as well as the men who served on the ship, and those who were onboard the German submarine U480, which sank the ALBERNI. Visitors can learn all these facts and more as they wander through the museum, which has expanded beyond the HMCS ALBERNI to encompass the histories of people, and their stories woven in, through, and because of the war. “I find it hard to explain,” Bartholomew says. “You get these people who served in the war, talking to you and you watch their face, and there is an amazing change that happens. Their eyes change. Their eyes are no longer old. Nothing physically is changing. I don’t know how to describe it. There is a change that comes into their eyes when they tell these stories because they are reliving it. “We’re all volunteers, and that’s how we get paid here—in these wonderful stories that this exhibit pulls out of people,” he adds. Bartholomew speaks of a couple of young children who have come into the museum, specifically a little girl in a princess dress who loves looking at the displays, and another young boy who was so fascinated by what he was learning that Bartholomew ended up giving him a book. When children respond to the museum he knows he has touched a new generation, carrying the past into the future and keeping the memory alive, which enables us to continue honoring the soldiers, the men and women of the war, and people’s lives. “People have tried to go through [the museum] and it so overwhelms them that they come to the desk. ‘That’s all I can handle for today. I’ll come back next week.’” Bartholomew feels honored that people are so touched by the stories he has compiled and put on display. A war bride is a woman from WWI or WWII who married someone from a different country and chose to move to his country. The show will feature women who ended up all over the world, as the war brides both came to Canada and left. Whenever possible, Tosh interviewed the featured woman or their family and has written a short story to accompany the painting. Bartholomew has arranged to have each caption translated into French as well. As an extension of the exhibit, Bartholomew is currently working with a sculptor to create a ‘War Brides’ sculpture, which he intends to install in the waterfront Marina Park at Comox Harbour. Bartholomew was awarded the 2015 Heritage Award by the Town of Comox for his work in preserving Canadian history. He received the Paul Harris Fellowship from the Rotary Club in 2015. He is also the founder of the Comox Valley Museum Association. Bartholomew loves this work, and he has never minded putting in the finances when needed. Donations have come in over the years and he has been able to find the occasional grant, but the project is always looking for sponsors. He is hoping that the Society can transition into being self-sufficient, mainly due to his health.